From there, they wrap around the ribs to the front of the body, and attach on the upper arm. In my classes, I often refer to this muscle, along with the serratus anterior, as the ‘side ribs,’ because it can be felt most on the sides of the ribs beneath the armpits. It also broadens the low back, but I find less muscular sensation there. You need to learn how to use the Lats because of their role in stabilizing the body. Broadly speaking, they connect and coordinate movement between the shoulders and the pelvis. Most people that live a typically Western lifestyle are very weak on the sides of their body. There is a lot of tension along the spine, especially in the shoulders and neck (rhomboids, trapezius), and since those muscles are already hyper-responsive and engaged, beginner Yogis tend to keep using them rather. Of course, this only compounds the problem of pain and hypertension. Using your Lats will help to create balance and health in the shoulder girdle and neck. They are essential for stability and safety in any pose in which weight is on the hands, including arm balances and inversions. Using the Lats will also help you guide the upper back and shoulders to participate in backbending postures, rather than only the lower back (which is harmful over time). Rehabilitating the side ribs will even open a new dimension of breath, allowing increased lung capacity and movement. As such, they will be used frequently in Yoga practice. 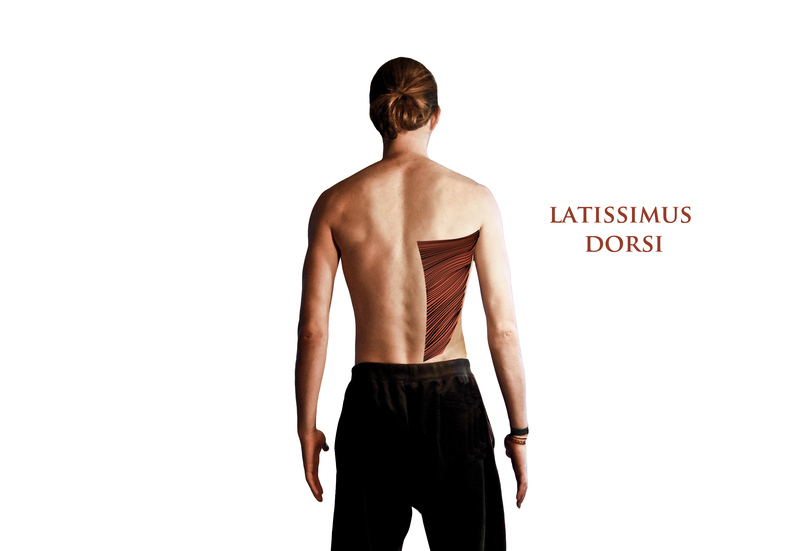 Weakness or tightness in the Latissimus Dorsi muscles can lead to compromised posture in any Yoga postures that incorporate the movements mentioned above. Downward Facing Dog (Adho Mukha Svanasana) is a great example. As you can see, engaging the Lats creates a very visible broadness across the shoulders. Less visible is the greatly increased sense of stability and power. This may be slightly counterintuitive as the hands are immobilized in this position, so the Lats may, at first glance, seem unnecessary for this movement. Any pose with lifted arms can benefit from similar advice. After all, Downward Facing Dog is a raised-hands pose, it’s just inverted so that you’re upside down. The following photo shows arm positioning common to Sun Salutations, Tree Pose, Warrior I & II, and many more. Apply the same advice as Downward Facing Dog – pull the shoulder blades down the back towards the pelvis, expand the shoulders to the sides, away from the neck, and rotate the elbows to face each other. 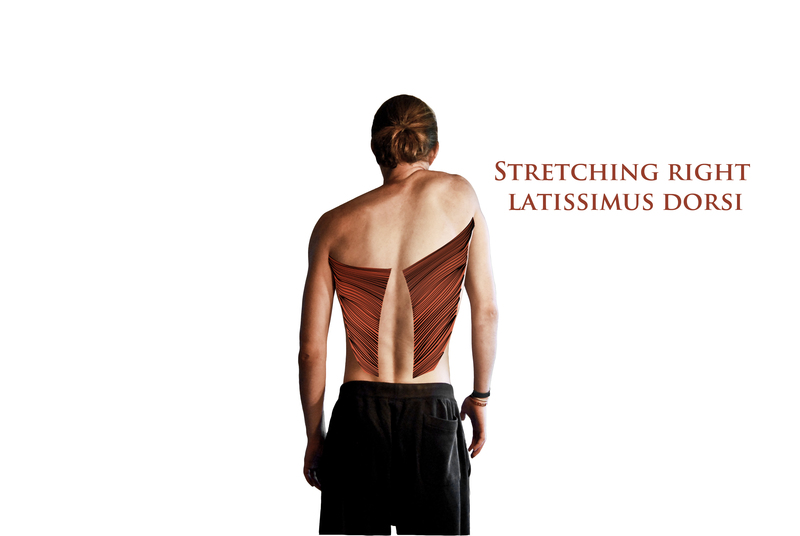 It may be tempting to let the shoulders creep up around the ears for the sake of bringing the palms together if you have limited shoulder mobility, but it is recommended to keep the hands apart and focus on lengthening the Latissimus Dorsi until there is sufficient flexibility in the shoulders to perform this position properly. The next step is to learn how to lengthen the shoulders while still maintaining the integrity of the side ribs. It can seem confusing: the Lats pull down and broaden, but that is not the only action at work. You can still lift your hands and reach upwards while keeping the Lats engaged. This sounds paradoxical, and it feels that way too: the sensation is one of your muscles working against each other. However, the result is that you will enjoy broad, expansive shoulders plus the lift and tensile strength of extension. As with many aspects of Yoga, we’re not trying to go from one extreme to the other, but rather to take on the best qualities of both. Don’t worry; you’ll need to practice to get the hang of it. Learning to use your Lats is one of the best ways to improve your Yoga practice. This movement is essential for a healthy back and spine and an open rib cage. During your next practice, make friends with your Latissimus Dorsi! It has a lot to offer you.